The U.S. Fish and Wildlife Service (Service) intends to conduct three prescribed burns in October and November, 2017 on the Valentine National Wildlife Refuge(NWR) south of Valentine, NE in Cherry County. A prescribed fire is one that is planned and deliberately set to accomplish specific goals. On the refuge, the goal of prescribed burning is to enhance wildlife habitat. Before a prescribed burn can go forward on the refuge, a burn plan must be written which outlines all of the details necessary to conduct a safe burn and to achieve desired results. The Valentine NWR utilizes many management tools to manage the prairie- from burning and grazing to haying/mowing and herbicide treatments. Prescribed burning is a very important tool that brings back a historic disturbance that native prairie plants evolved with. Since most prairie plants grow from belowground buds, they are less vulnerable to fire than trees and shrubs. A fall, or dormant season, burn simply burns up the old stems and leaves of prairie plants. By burning those dead stems, the fire helps stimulate growth in the coming season. The new growth is invigorated by the influx of nutrients from the ash and increased sunlight to the blackened earth, which warms the ground and is available to new shoots as they emerge in the spring. The refuge utilizes fire and grazing together in many instances to control invasive plants and promote native species. Grazing animals find the increased palatability of the new shoots of the cool season grasses such as Smooth Brome and Kentucky Bluegrass. A follow-up grazing treatment can suppress those plants and favor the growth of native warm season grasses such as Big Bluestem and Indiangrass. These native grasses as well as native wildflowers thrive after a combination of these treatments, which in turn benefits nesting waterfowl and grouse, as well as native migratory birds and pollinating insects. 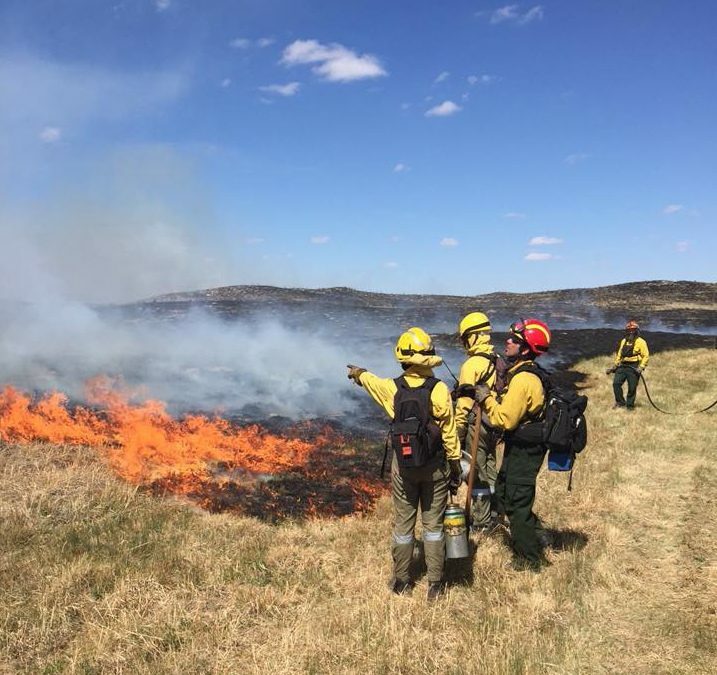 The objectives of these burns are to remove excess thatch buildup, control non-native plants, promote native plant species diversity and limit encroachment from Eastern Red Cedar and other trees into the Sandhill prairies. Safety is the most important factor in refuge fire operations and all of the following measures will be followed. Every Prescribed burn has specific requirements, including description of area, expected weather and fire behavior, communications plans, as well as ignition plans, holding plans, contingency plans, safety plans, job hazard analysis and site specific hazard plans. The burn plan includes parameters which must be met before any type of ignitions are made to ensure that the fire can be done safely. These include a minimum number of people and fire engines, limits on wind speed and relative humidity, and consideration of sensitive areas. Firefighters are well trained through the National Wildfire Coordinating Group and must pass arduous physical tests. The refuge has prepared a burn plan and will notify neighbors and local news outlets prior to conducting the prescribed fire operations. Crews from the U.S. Forest Service, the National Park Service, The Nature Conservancy, and individuals from rural fire departments will assist the Service with the prescribed burning.